On the north east corner of the Bulcan Peninsular, bordering the Black sea, Bulgaria has long been a link between east and west and has, at times, had a turbulent past. It is a country with plenty of history and evidence of earlier civilisations. The mountain regions of Bulgaria are also a winter sports destination. Bulgaria is a member of the European Union and the currency is the Bulgarian Lev (BGN). 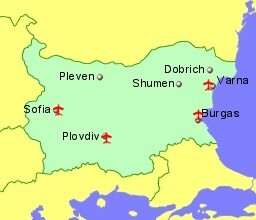 Bulgaria is also a Schengen country. Located 6Km North of Bourgas on the Black Sea coast, eastern Bulgaria.